Argh! Avast, me hearties, yo-ho! And pass the rum! It be Talk Like a Pirate Day again, and Jen-luc Piquant is thrilled to be able to don her spiffy piratical duds to celebrate. There's all kinds of festive Cybersport taking place, including a nifty guide with tips on how to convincingly talk like a pirate, and a program that will translate an entire website (including every entry at the cocktail party) into Piratese. In need of piratical reading material? Last year, I wrote a lengthy post in praise of Gideon Defoe's highly amusing Pirates! series, focusing on their adventure with scientists, although there's now three such books, and they're all loads of fun. Alas, my proposed Talk Like a Physicist Day has yet to gain momentum, in part because nobody's bothered to set an actual day -- Einstein's birthday on March 14 should suffice. That gives us several months' advance notice to prepare. Jen-Luc sez we're all on notice! If talking like a pirate isn't your bag, you can always emulate the young Pat Boone's disastrous attempt at a Scottish accent in the 1959 flick Journey to the Center of the Earth, based on the famed sci-fi classic by Jules Verne, and supposedly filmed on location in New Mexico's Carlsbad Caverns. Future Spouse rented the DVD a couple of nights ago, and we watched in appalled fascination at the spectacle unfolding before us. Hard to believe the film was nominated for three Oscars (for sound, special effects, and set decoration); now it's definitely fodder for the MST3K treatment. It has it all: bad science, silly experimental apparatus, and gratuitous sexist slurs made by the chief scientist against the Widow Goteberg (Arlene Dahl), a feisty smokin' hot chica in a whalebone corset who insists on tagging along on the expedition in exchange for donating her late husband's supplies. (Jen-Luc thinks all explorers should all be so well-dressed.) You also have an evil nemesis who says things like "I never sleep. I hate those small slices of death," plus a big blond Icelander who's a bit too fond of his pet duck, Gotrun. The duck is actually the smartest member of the expedition, and the film's saddest moment is when poor Gotrun gives her life to save the silly inept humans. Eith er that, or she was driven by suicidal despair at having to be around them that long. The mere presence of 1950s singing sensation Pat Boone (in a kilt, no less) means there must be occasional bursting into song, such as serenading his professor's daughter with a schmaltzy musical rendition of the Robert Burns poem, "My Love is Like a Red Red Rose." For much of the journey, he carries a small accordion, so there's always the chance he could start singing at any moment, just for a bit of added suspense. (A bit of musical accompaniment would have been welcome during the sudden halt in the action to debate the ethics of capital punishment.) Future Spouse particularly enjoyed the opening scene where James Mason's professor has just been knighted, and is greeted by his graduate class as he enters the lab with a celebratory choral bit in perfect harmony: "How come my students never burst into song when I walk into the classroom?" Although he'd be just as happy with the occasional gift of a Bacon Chocolate Bar from Vosges. In all honesty, we rather enjoyed watching the film, even though it got a bit tedious towards the end. Our intrepid scientists find the lost city of Atlantis, are nearly drowned, lose their way, are menaced by giant lizards once they reach the Earth's "center" -- remember, those special effects were deemed Oscar-worthy in 1960! -- and ultimately escape by setting off explosives to cause the volcano they're in to erupt, hoisting them to the surface in a makeshift stony saucer just big enough to fit the four of them (minus poor Gotrun). Jules Verne had an excuse for his questionable science: geological knowledge in the late 19th century hadn't progressed very far regarding what truly lay at the Earth's center, so he was free to let his imagination run wild. But by 1959, didn't we know better? I can't imagine anyone watching this not being reduced to giggles at the premise -- except perhaps for Sherri Shepherd, new co-host of The View, who apparently isn't sure if the Earth is flat. She probably thinks Journey to the Center of the Earth is a documentary, and lies awake some nights fretting that the giant lizards will one day escape and devour her brood. The entire impetus for Verne's fictional expedition is the accidental discovery that a bit of lava-rock presented to the newly-knighted professor as a gift turns out to contain a metal surveyor's plumb, indicating a possible lost civilization. That part is far more believable than the giant lizards, because such serendipitous discoveries occasionally do happen in science. In 1900, a Greek sponge diver named Elias Stadiatis discovered the wreck of an ancient cargo ship off the coast of Antikythera island in Greece. He and other divers recovered all kinds of artifacts from the ship. A year later, an archaeologist was studying what he thought was just a piece of rock recovered from the shipwreck, and noticed there was a gear wheel embedded in it. It turned out to be an ancient mechanical device -- perhaps the earliest example of a geared device -- now known as the Antikythera mechanism and housed in the Bronze Collection of the National Archaeological Museum of Athens. The device was originally housed in a wooden box roughly the size of a shoebox, with dials on the outside and containing a complex assembly of gear wheels within. Its very existence offers strong evidence that such technology existed as early as 150-100 BC but the knowledge was subsequently lost. Similar machines with equivalent complexity didn't appear again until the 18th century. Not surprisingly, scholars have been fascinated by the Antikythera mechanism ever since its discovery. It took decades just to clean it off, and in 1951, a British science historian named Derek J. de Solla Price began his life's work investigating the theoretical workings of the device. Based on X-ray photographs of the fragments, he published a handful of minor papers before the first major paper appeared in Scientific American in June 1959 (the same year Journey to the Center of the Earth was released, although we are sure this is purely coincidental). Entitled "An Ancient Greek Computer," the article detailed Price's hypothesis that the mechanism had been used to calculate the motions of stars and planets -- making it the first known analog computer. or move their marble feet." 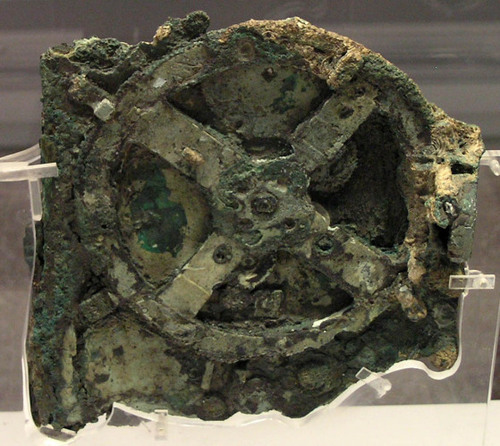 Researchers are still making surprising findings about the Antikythera mechanism. In 2002, Michael Wright, the curator of mechanical engineering at the Science Museum in London, made headlines with his new, more detailed X-ray images of the device taken via linear tomography -- which means that only features in a particular plane come into focus, enabling closer inspection and pinning the exact location of each gear. And he found that the device was even more complicated than Price originally thought. The device seems to have been designed well enough to reproduce the motion of the sun and mood fairly accurately, as well as the planets Mercury and Venus. But that leaves out Mars, Jupiter and Saturn, which were also known in antiquity. Wright speculates that there may have been an upper layer to the mechanism, now lost, with extra gears to model the missing planets. Wright eventually built a pretty darned impressive reproduction of the Antikythera mechanism, stacking the gears like layers in a sandwich. By winding a knob along the side, the various celestial bodies can be made to advance and retreat to determine their positions on any chosen dates. Wright used modern tools for his reconstruction, but has argued that it would have been possible to build it using ancient tools: the Greeks apparently had saws with teeth that were cut using v-shaped files, similar to cutting teeth on a gear wheel. Some things are still a mystery, such as the purpose of two dials on the back of the original device, one of which may have been used to indicate the year. Wright hypothesized that the lower back dial might have been used to predict eclipses. There's an ongoing Antikythera Mechanism Research Project devoted to undertaking, among other tasks, more advanced 3D X-ray imaging with the help of X-Tek Systems in the UK, and Hewlett Packard, among others. For instance, HP built a new 3D surface imaging device, the PTM Dome, which surrounds the object to be examined -- a critical factor in the current project, given the fragility of the Antikythera mechanism. X-Tek's contribution was a 12-ton microfocus computerized tomographer. These were used to examine the original fragments, plus new pieces discovered in October 2005 (there are now 82 fragments that have been recovered). A year later, the scientists announced that the new images had revealed much more of the original Greek transcription, which was subsequently translated -- from about 1000 characters to 2000 characters, or roughly 95% of the surviving text. A November 30, 2006, article in Nature included a new reconstruction of the device based on the high-resolution X-ray tomography conducted by the study. Based on the new discoveries, the mechanism has been pretty much confirmed to be an astronomical computer used to predict the positions of heavenly bodies in the sky. Current predictions are that it once had 37 gears, of which 30 survive, and its front face had graduations showing the solar cycle and the zodiac, along with pointers to indicate the positions of the sun and moon. I would love to have my very own functioning orrery, but space in our Los Angeles loft is limited, particularly given my hopes of adding a working cloud chamber to the decor. But we now have a spiffy tabletop armillary sphere, which serves roughly the same purpose, gracing the premises. Ironically, a rudimentary, sad excuse for an armillary sphere (they probably made their own on the set) also graced the office of the chauvinistic professor in Journey to the Center of the Earth -- just to establish that he was a bona fide respectable scientist, don't you know, should the recent knighthood leave any doubt. There's a reason so many portraits from the Renaissance depicted their science-minded subjects in rooms containing such objects. Prior to the invention of the telescope, an armillary sphere was pretty much de rigeur for any astronomers aiming to determine celestial positions. Plus, they look really cool. Should we ever commission an official "portrait" of Future Spouse, you can bet we'll include our armillary sphere. Is an avatar allowed to have both pirate and ninja costumes? Doesn't that transgress some sort of boundary? It's quite small also so it should fit even in your loft. The best thing about Journey to the Centre of the Earth has got to be the score by Bernard Herrmann. The music as sunlight hits the mountain peak, illuminating the path to the center of the Earth, gives me chills. In partial defense of Journey..., I was eight years old in 1959, and to judge fom the audience when I saw it, I was pretty much the target demographic. So it's perhaps harsh to hold it to the standards of an grown up movie. I thought it was whizzo, although I complained vociferously to my parents about the unconvincing behaviour of the "Dimetrodons", and expect a lot of other geeky kids did too. Hello dudette, this post is awesome... I enjoy a lot this movie "Journey to the center of the earth" and its cheap fx, specially the dimetrodon, that really were iguanas with rubber crests, and these red lizard, poor of it, was burned into a river of lava.